Here is a wonderful and super simple side dish for the holidays or any day of the year. This dish takes no more than 20 minutes to make from start to finish and the flavor is amazing. And this recipe is super healthy because it is anti-inflammatory, lowers cholesterol, helps to prevent heart attacks and strokes, it’s antibacterial, helps with arthritis, and works wonders to keep away cancer. I made this recipe for Thanksgiving and I will make it again tonight. I have to say this dish disappeared at Thanksgiving… people loved this recipe. Full of flavor and nice and sweet it’s sure to please. 1/3 – Cup of Organic Tawny Port – All the Alcohol Will Disappear and All That is Left is that Nice Port Flavor. Take the Brussel Sprouts and trim off all the dark spots and cut them in half. 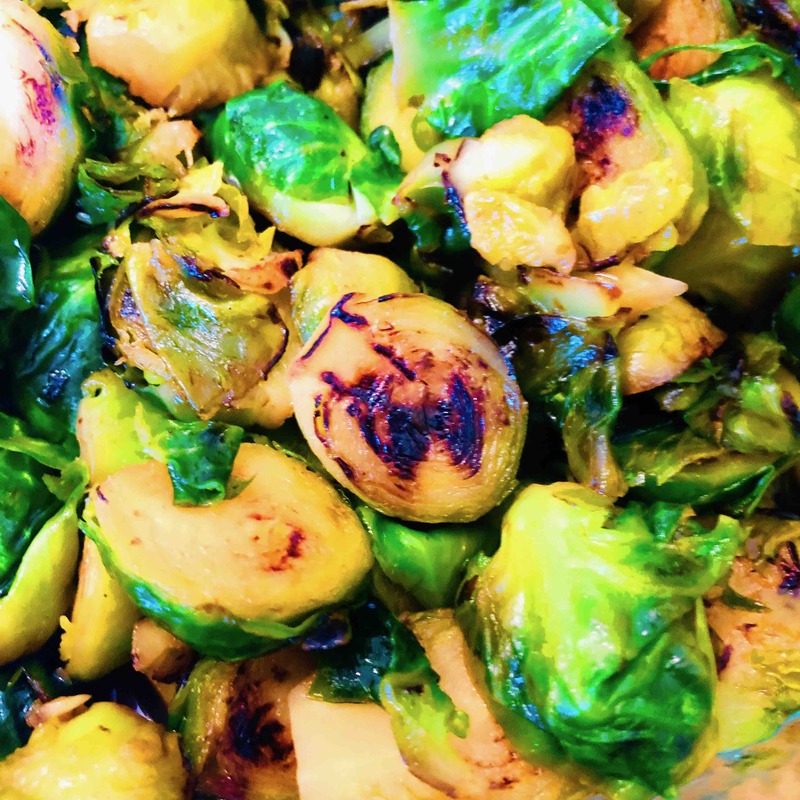 Then take a large pot and bring the heat to medium… and pour in the Brussel Sprouts and keep them moving with a wooden spoon. Don’t let them burn, get a nice braised look on the outside… keep them moving all the time. Then add the port and keep moving until the port liquid disappears. Then add the honey and keep the sprouts moving fast because they can burn if you don’t keep them moving. When everything is incorporated into the sprouts remove them from the stove and pour them into a serving dish and serve. This Dish is Super Simple… But Has Great Flavor and It’s Super Healthy! Remember – Always Eat Organic – Regular fruits, veggies, and grains contain up to 30 to 50 disease and cancer-causing chemicals – Not Good – Eat Organic and Stay Healthy! Enjoy This Wonderful Holiday Recipe! Skype – drpaulhaider – and my cell phone is (831) 869-9119 – EST Time Zone. And you can make a small or large monthly donation on patreon see link – https://www.patreon.com/Drpaulhaider and where it says $1 a month you can change that to whatever amount you like. — I thank you in advance.!!!! This entry was posted in Healing Herbs, Recipes and tagged A Great Holiday Side Dish, Amazingly Tasty, and the flavor is amazing, Another Whole-Foods Plant-Based Recipe, Anti-inflammatory, antibacterial, anticancer, Delicious Braised Tawny Port and Honey Brussel Sprouts, Don’t Let Them Burn, Dr. Paul Haider, easy, Everyone Will Enjoy These Brussel Sprouts, from start to finish, Having a Great Life, Healing, Health, Helps to Prevent Heart Attacks and Strokes, helps with arthritis, HH, Immune Boosting, Keep the Sprouts Moving, Lowers Cholesterol, Master Herbalist, Organic Brussel Sprouts, Organic Honey, Organic Tawny Port, Photo, Recipe, spiritual teacher, Super Simple, This dish takes no more than 20 minutes to make, USA. Bookmark the permalink.